Hi everyone. I’m busy again this year with a new classroom gifty for my son’s 5th grade kiddo’s. Last year I did Grinch Pills and you can find that post HERE. 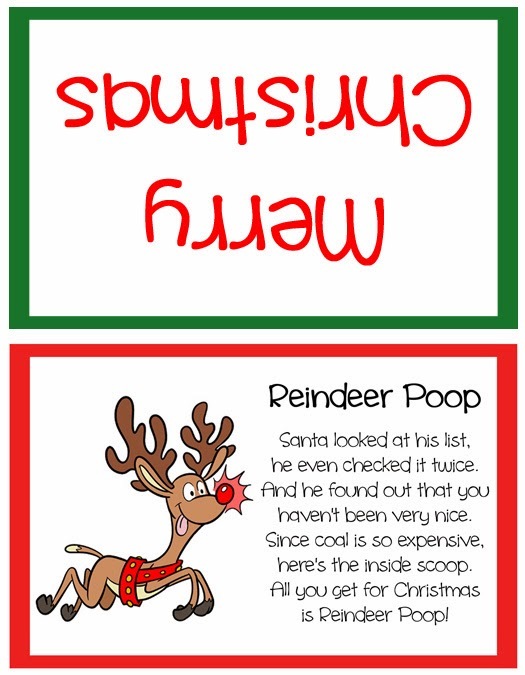 This year I’ve got some Reindeer Poop for them. I filled a little 3″ x 3″ zip loc baggie with Milk Duds (Whoppers or Raisinettes work well too). I then printed my graphic, folded it in half and stapled it to the top of the candy bag. I finished it off with a tiny little bow made of 1/8″ Red Diagonal Stripe Ribbon from Really Reasonable Ribbon. There are lots of different reindeer poop poems and projects ideas on Pinterest. Yes, you would be amazed how many! 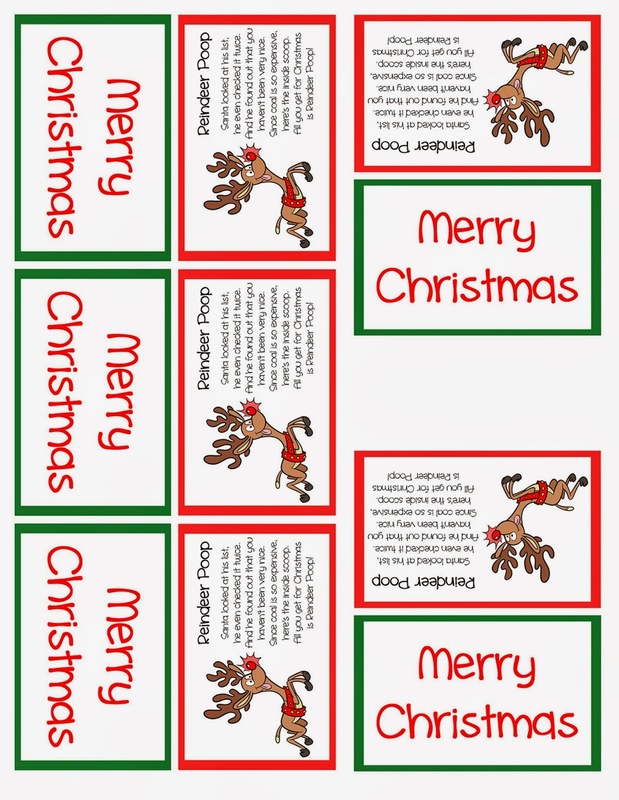 I wasn’t totally thrilled with any of the free printables offered though, so I set out again to design my own. This is always an adventure because it’s so long between each project that I make, it’s like learning all over again. I must start using my software more often! 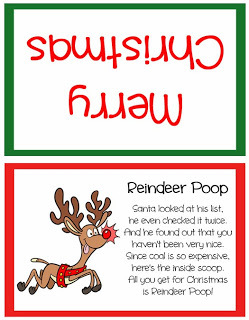 My cute little reindeer is a free graphic from http://timvandevall.com/. Take a look at this great website. He has lots of great freebies and other fun stuff. 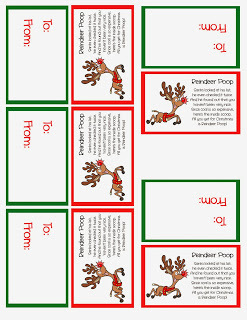 Feel free to use my Reindeer Poop sheets, but they are meant for personal use only. I used the generic Merry Christmas ones so they could just be passed out to the children easily, but I made another option with a to and from on the back. Use whichever works best for you. Simply click on any of the graphics and save them to your computer and then print them. 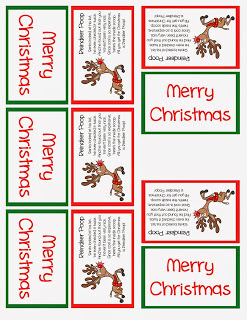 Here are full sheets set up for printing on 8-1/2″ x 11″ card stock. This is a great fast and easy project. Once I had the graphic designed, I whipped up 24 of them in a couple of hours. That includes packaging the candy, printing and cutting out the pieces, and adding the bows. Yay!! 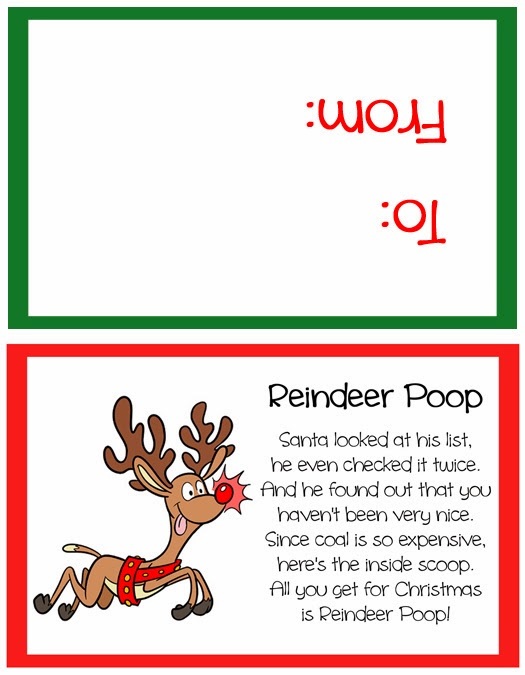 Reindeer Poop!! I sure hope I get some in my Really Reasonable Ribbon stocking :0) Super Cute Bonnie!! LOVE it!! Absolutely darling Bonnie! heheheh love the little poem too, super sweet!!!! oh I love this. THANKS!